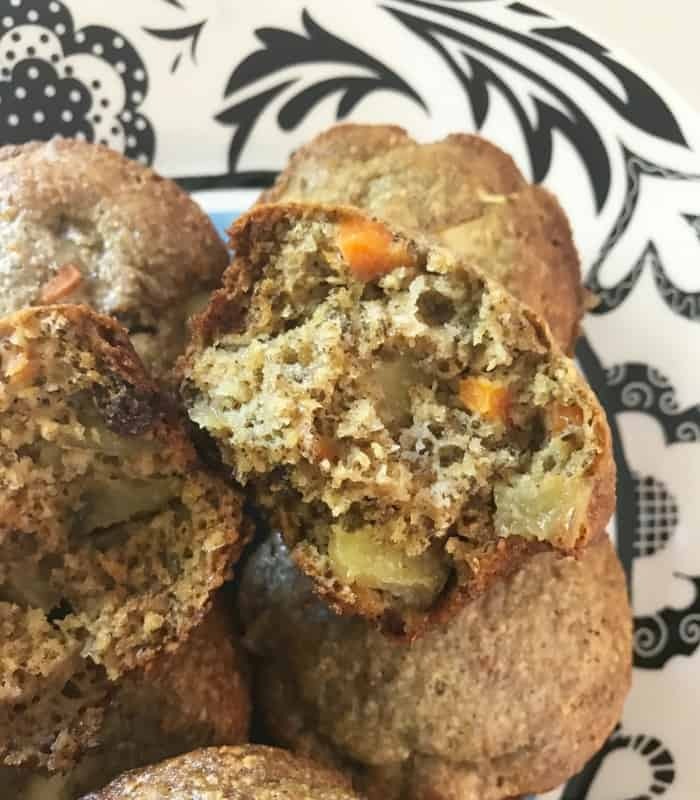 These delicious high fiber flax muffins are easy to make and full of sweet apples, raisins, and bits of tender carrots. Add a dash of nutmeg and cinnamon to the recipe and they’re a perfect fall treat! 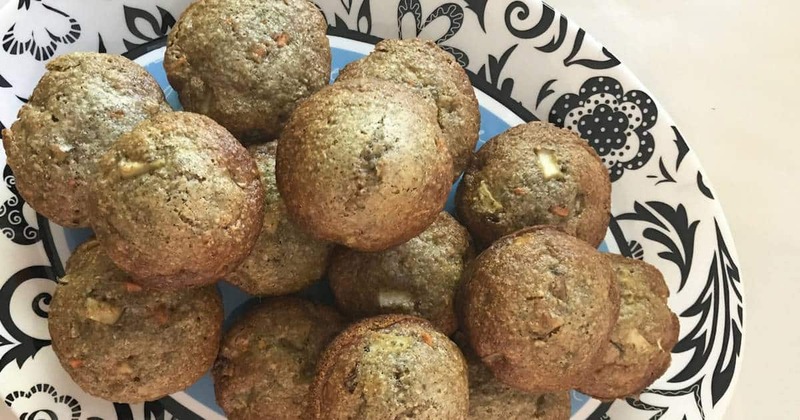 This recipe yields about 15 muffins. If your family can’t eat them all in a day or two, you can store them in the fridge or freezer and pull them out for a snack later. The ingredients are mostly inexpensive; I get everything at my local Aldi store except for the flax and oat bran. I buy this flax seed from my local health food store’s refrigerated section, and the oat bran online, here. And remember, when you’re eating more fiber you should also drink plenty of water to help flush your system. You might also like to try my yummy banana bread recipe, too. 1. Preheat your oven to 350. Prepare your muffin pan. I do this with a quick swipe of shortening on a paper towel… my muffins never stick to the pan when I use a tiny bit of shortening like this, and I don’t need to bake them in liners. 2. In a large bowl, mix flour, flax, bran, baking soda, baking powder, salt, and a dash of nutmeg and cinnamon. Add the milk, sugar, eggs, and oil; stir until just blended. 3. 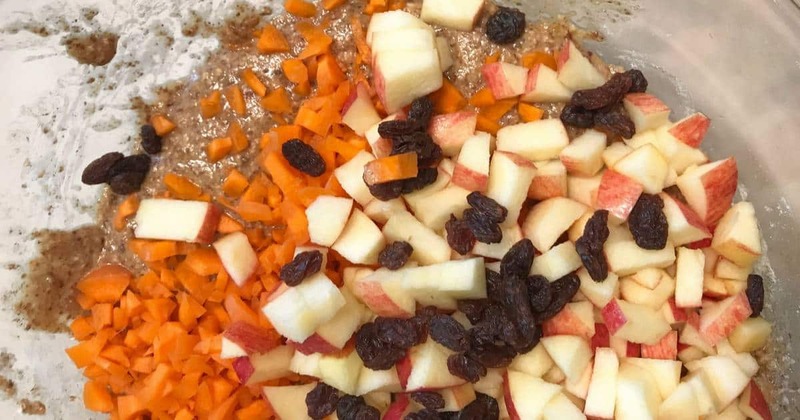 Stir in the carrots, apples, and raisins. 4. Fill the muffin cups 2/3 full with batter. I use a 1/4 cup stainless steel measuring cup to do this, slightly underfilled with batter. 5. Bake at 350 for 15 to 20 minutes until deep golden brown and a toothpick inserted in the center comes out clean. Please use the photo below to PIN this recipe to Pinterest. Thanks!